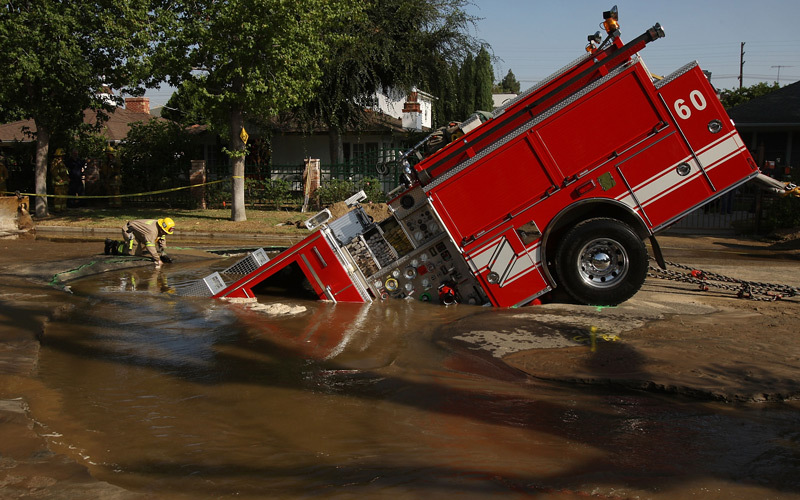 A 22-ton Los Angeles Fire Department fire truck protrudes from a sinkhole in 2009. The hole apparently was caused by a broken 6-inch cast iron pipe. Reprinted with permission from Strong Towns. To borrow a real estate term, America’s infrastructure is a non-performing asset. For nearly every American city, the ongoing cost to service, maintain and replace it exceeds not only the available cash flow but the actual wealth that is created. For example, we did a deep financial study of the city of Lafayette, Louisiana. We found that the city had public infrastructure–roads, streets, sewer, water, drainage–with a replacement cost of $32 billion. In comparison, the total tax base of Lafayette is just $16 billion. Imagine building a $250,000 home and needing an additional $500,000 in infrastructure to support it. This seems incredible. But not only is it common, it is the default for cities across America. This imbalance is caused by incentives we embed in our current approach. When the federal government pays for a new interchange or the extension of utilities, local governments gladly accept that investment. The city, while spending little to no money of their own, has an immediate cash benefit from the jobs, permit fees and added tax base. The only thing the local government must do is promise to maintain the new infrastructure, a bill that won’t come due for decades. Here’s the catch: when we look at that bill, our cities almost always can’t pay it. Cities never run a return-on-investment analysis that includes replacement costs. Cities never even compute the tax base needed to financially sustain the investment. There’s no incentive to do it and every reason not to. In psychological terms, this is called temporal discounting. The people running local governments, as well as the people they serve, have the natural human tendency to highly value free money today and deeply discount, if not altogether dismiss, the financial burden these projects will create in the future. We’ve been building infrastructure this way for two generations. We have created a lot of short term growth, but we’ve also created trillions of dollars of non-performing assets, infrastructure investments that are slowly bankrupting our cities, towns, and neighborhoods. What do we do today? To paraphrase former Defense Secretary Donald Rumsfeld, we’re going to make investments in infrastructure with the systems we have, not the ones we wish we had. There are ways to get better results now. We need to prioritize maintenance over new capacity. With so many non-performing assets, it’s irresponsible to build additional capacity. Project proposers will try to add additional capacity with their maintenance projects. If it is truly warranted, it can and should be funded locally. Cities need to discover ways to turn such investments into positive ROI projects, a process the federal government can only impede. We must prioritize small projects over large. Small projects not only spread the wealth, they have much greater potential for positive returns with far lower risk. Large projects exceed their budgets more often and with greater severity–dollars and percentage–than smaller projects. A thousand projects of a million dollars or less have far more financial upside than a single billion-dollar project ever will. It’s administratively easier to do fewer, big projects, but that is a bureaucratic temptation we need to overcome. We should prioritize neighborhoods more than 75 years old. We’ve modeled hundreds of cities across the country and in every one the neighborhoods with the highest investment potential are the ones that existed before World War II. These are established places where small investments have a huge impact. Most investments in neighborhoods built after World War II are simply bailouts, pouring good money after bad. Small maintenance projects focusing on below ground infrastructure in old, established neighborhoods have the greatest potential for positive returns. These projects will put people to work, create jobs and fix failing infrastructure as well as, if not better than, the large expansion projects currently in the shovel-ready backlog. These are also the kind of projects that get private capital off the sidelines and back to work building wealth in our communities. In addition, while we understand that a surge in infrastructure spending is not going to wait for systematic reform, there are some modest–yet transformative–reforms we can make as part of this process. Require states and municipalities receiving funds to do accrual accounting. Governments must have a real accounting of their long-term liabilities, including infrastructure, on their balance sheet. The days of fake financial statements that ignore government’s long term promises needs to end. Require municipalities to account for infrastructure as an accruing liability instead of a depreciating asset. Cities have an obligation to maintain infrastructure. It’s improper to pretend infrastructure is an asset that loses value as it ages. Like pensions, infrastructure is an inter-generational promise that is properly accounted for as a liability.